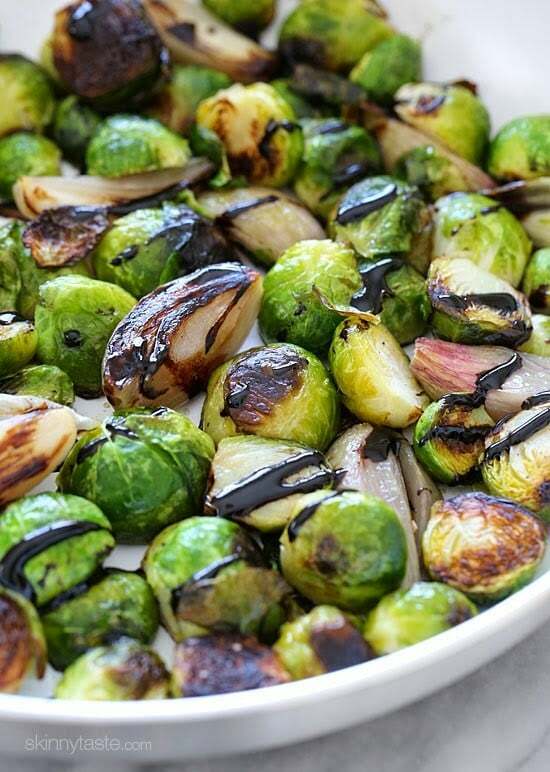 These pan roasted brussels sprouts and shallots are perfectly charred, and finished with a sweet balsamic glaze. Here’s a few more Brussels Sprout Recipes I think you’ll enjoy: Shredded Brussels Sprouts with Pancetta, Brussels Sprouts Gratin, and Brussels Sprouts and Sausage Parsnip Spiralized Pasta. Please welcome my friend and guest author Jackie Ourman, who writes at CAFE Celiac & Allergy Friendly Epicurian. I tested these out myself while taking the photos and we LOVED this recipe! I am slightly obsessed with Brussels sprouts. I love all of my veggies but these are definitely high up on the list. I often crisp up pancetta or bacon and then roast the sprouts in the fat. They get a little soft in order to have the rich color I like but that’s ok because I still have the crunchy bacon or pancetta to sprinkle on top. Now that I am watching my calories, I’m forced to think a bit more creatively about how to get that delicious roasted flavor without softening the Brussels sprouts too much. 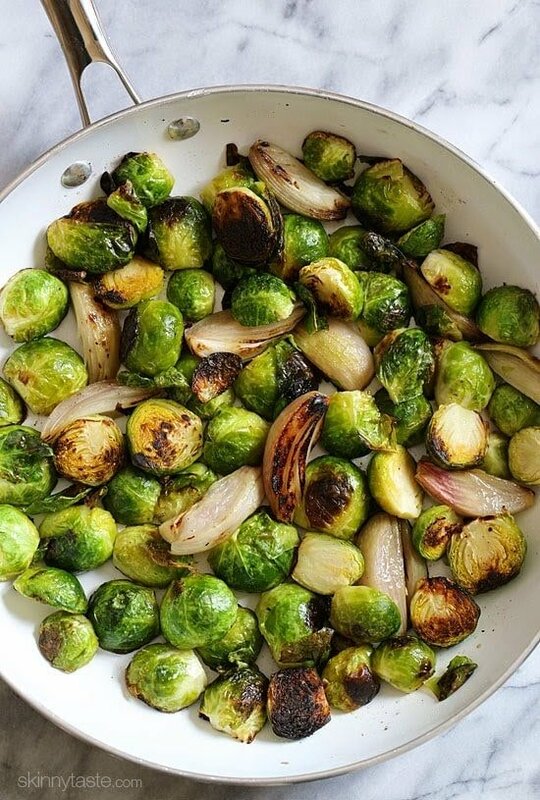 In this recipe, instead of roasting them in the oven for a long time, I quickly brown the Brussels sprouts with shallots in a sauté pan and then roast them for just 10-12 minutes. Everything comes out deliciously caramelized yet there is still a nice bite. The drizzle of balsamic glaze adds a hint of sweetness and is the perfect pairing. I couldn’t stop eating them. I will likely double the recipe next time because this dish almost didn’t make it to the dinner table. Preheat oven to 425°F. Heat an oven-safe nonstick 12-inch sauté pan over medium-high heat and add olive oil, Brussels sprouts and shallots in one layer and let cook undisturbed for about 3 minutes until beginning to caramelize. Turn occasionally for an additional 2-3 minutes until golden all over. Transfer to the oven and roast for 8-10 minutes, until softened a bit but still slightly al dente. Drizzle with balsamic glaze, toss and serve. Do you think these could be pan roasted on Tuesday night and finished in the oven on Thursday? I am traveling for Thanksgiving. Any ideas? I was watching to see if anyone would respond to this. I am also curious! If you tried this, please let us all know how it worked out. I have never, ever liked brussel sprouts! The smell, the texture, the gas they cause…they just weren’t for me. Then I realized, the only way I was ever presented these veggies was steamed. And I absolutely do not like steamed brussel sprouts. Roasting them; however, is a game changer. Adding a balsamic glaze and my head exploded. These are amazing and have changed the way I think about these sprouts. Thank you! Just wondering why this isn’t whole 30 compliant thanks!! 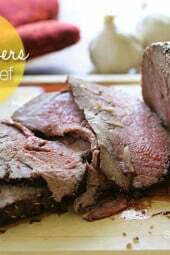 I know this is an old post / recipe here but found it awhile back and decided it was PERFECT for Friendsgiving on Saturday night. Can’t wait to make it. Thanks!! I love this recipe and have made it multiple times. I am trying to figure out how to adapt it to bring to a Thanksgiving feast. Do you think I can make it ahead, then place it in pan and somehow keep it warm until serving time without it deteriorating? Any suggestions? Thanks! How would you do this s. do ahead recipe if I want to bring it to someone’s house? I love your recipes and would like to have this one on my Thanksgiving table…BUT, I can’t have anything with onion….could I add Onion powder? or any other additions? Thank You! Can I add asparagus to this recipe? I just tried this tonight. I got the Costco bag of a bazillion brussels sprouts, and tonight's meal was the second using them. We both loved these so much and it was so easy! I didn't have shallots so added a little minced garlic. 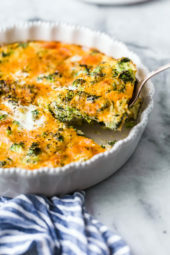 Fast, easy, delicious, and healthy! Looks good, I am gonna try this at home. These sound amazing! I'll definiely try them. Made this tonight! It was fabulous! THIS is most certainly one of my FAVORITE B-Sprout COMBOS!!!!!! Love, love, love Brussels sprouts! Why didn't I ever have these as a kid….fully plan to try this recipe with my toddler, maybe just the trick! Thanks! My husband loves brussel sprouts, so going to make this for him. I know this is delish because I made the same recipe last week! I love brussel sprouts and love shallots!!! I'm not a fan of vinegar, but really LOVE balsamic glaze used in its place! YUM! 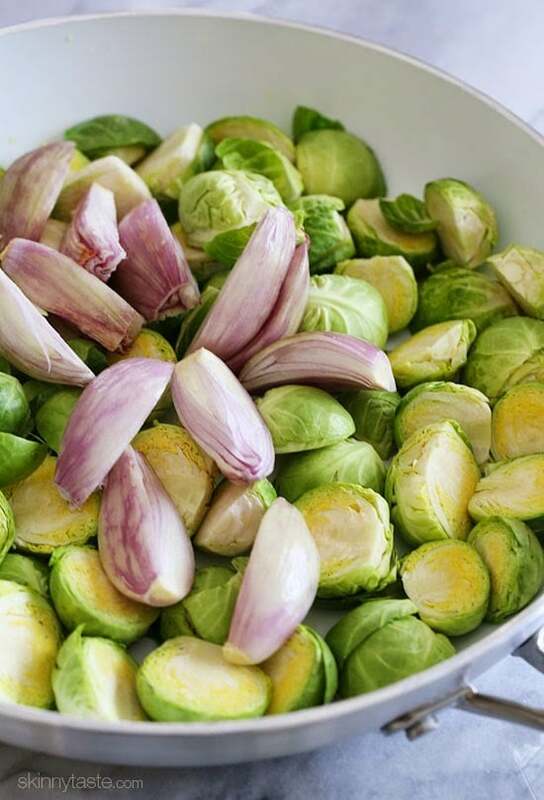 Brussels Sprouts are hands down my absolute favorite veggies and this recipe looks delicious. Will have to give this a try. Gina, I parboil my sprouts usually before I roast them with olive oil and garlic. It helps get out the bitterness. Can I parboil the sprouts for 2-3 minutes after slicing them and then complete the recipe as it is? I'd thrown out a lot of sprouts until I discovered parboiling. Well, I must be in the minority as I have tried Brussel sprouts and find them just tooooo bitter. I have roasted them, sautéed them, steamed them…and just can't get them to taste right will give this one a try, as many of my friends just love them. I did have them served as an appetizer and those were good. what am I doing wrong? picking the wrong ones up at the store…how do I select them? do I take off the outer leaves? These are Soo not bitter…In fact I hate broccoli rabe for that reason… these brussel sprouts are yummy!! Trader Joes' sells a good balsamic glaze too. 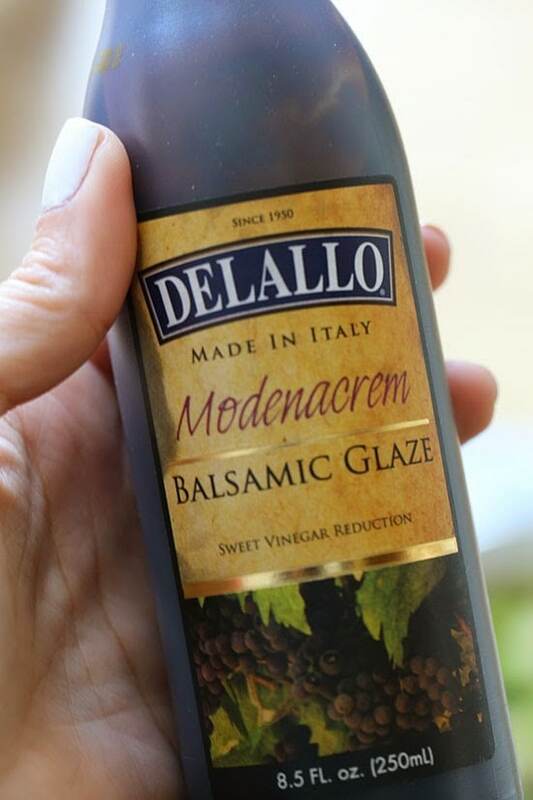 I use balsamic vinegar since I always have that on hand mixed with a tablespoon or so of sugar free maple syrup to use as a glaze. Gina, would it be possible to make this recipe with frozen sprouts? I'm sure they won't crisp the same but would love your thoughts! Would love to try this recipe today but I'm snowed in with no end in sight. Meredith, you can definitely make it with frozen sprouts. You are right, they won't really crisp as much since some liquid will come off of them while cooking and you may need to adjust the time a bit to account for defrosting but the flavors should still work great. Stay warm! Thanks Jackie, will try it out in a small batch first! Brussel sprouts are my new French fry. LOL! 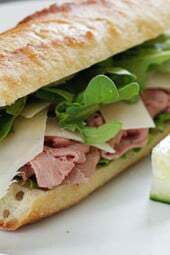 I make this recipe on a regular basis and add turkey bacon. The added bacon flavor is great and does not give many added calories. Great Post and Nice Article.Brussels and Balsamic Are looking so Good and Beautiful.I like it.thanks for sharing. Hmmmm, I love brussel sprouts, too. Thank you for this recipe, i will give it a try. I am OBSESSED with the combo of Brussels and Balsamic Vinegar. It's basically like eating candy. YUMMM! This sounds weird but I LOVE brussel sprouts with tomato sauce! 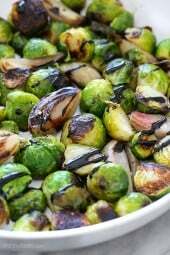 Love brussel sprouts roasted!! The small of steamed sprouts is the worst thing in the whole world thought… never ever, ever do it! I'm in the LOVE column with brussels sprouts, too! 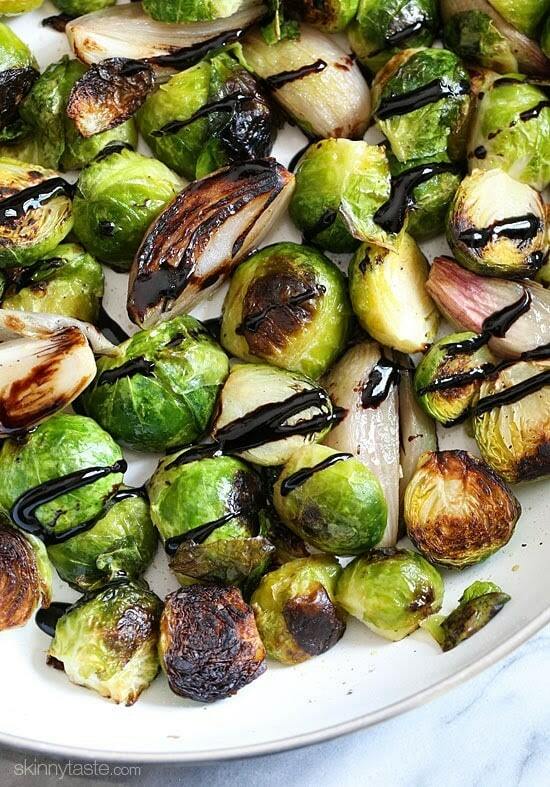 I roast them all the time with oil, garlic, salt, and pepper…but the addition of the balsamic glaze sounds delicious! I will definitely try this! I adore brussels sprouts! These look amazing, Gina! I'm excited to try them! I love roasted brussels sprouts! These look phenomenal! I have to make these very soon. Delicious! These look sooo good! I love brussels, and I love balsamic, it's a win win. Great for you too! Brussels sprouts are high on my veggie list too. Not as much so for my husband so I am constantly trying new ways to serve them to meet his needs. Love this recipe! I never thought to cook them on the stove and then transfer to oven, I've always just roasted them. I might need to try this new method! You can make your own balsamic glaze. I was wondering about this! Thanks! Thanks so much for having me here, Gina. It is always so nice to connect with the Skinnytaste community! I love your photos and am so happy you loved the recipe. Looks really good, I should try it one day! Do you know why it is that when I put the same exact ingredients into the WW Recipe Builder it comes up with 4 points per serving? I was going to see what difference it made to use balsamic vinegar (which I prefer over balsamic glaze) but in the process your original recipe turned out to be more points. I'm new to WW so haven't quite gotten the hang of it yet. Are you using the brussles as uncooked? Have you tried to air fry brussell sprouts? Read some of your other “air fry” posts but didn’t see these. D, When I use WW recipe builder, it comes out as 3 ppv. I'm not sure why you are getting a different points plus value. I'll mess around with it a bit later and see if I can find my error. Looks like a great easy recipe and can't wait to try it! I think I have an answer for you. If you read the bottle, it says sweet vinegar reduction under the balsamic glaze label. I think reducing the balsamic vinegar will increase the natural sugars found in the vinegar. In other words, the same amount of balsamic vinegar contains x amount of sugar but if it is reduced, the same amount of sugar would be increased because the water content would evaporate in the reduction so it would require more sugar laden balsamic to be needed to equal the amount. Does this make sense? Not sure I am explaining clearly what I am trying to convey. I know when I reduce balsamic vinegar at home, I do not end up with the quantity I start with and what does remain, is very sweet-and good! It seems Brussels Sprouts are one of those foods you either love or hate. I'm in the love column! These sound good. Pinning to try! !